Supply chain continuity is the hottest topic in BCM and driving a significant positive shift in corporate awareness of BCM. The BCI Partnership established a working group in 2011 to develop practitioner guidance on this topic following feedback from its annual supply chain resilience surveys. The group is chaired by Steve Wicks, who brings his own unique insight of being a BCM expert working in procurement at BP plc. 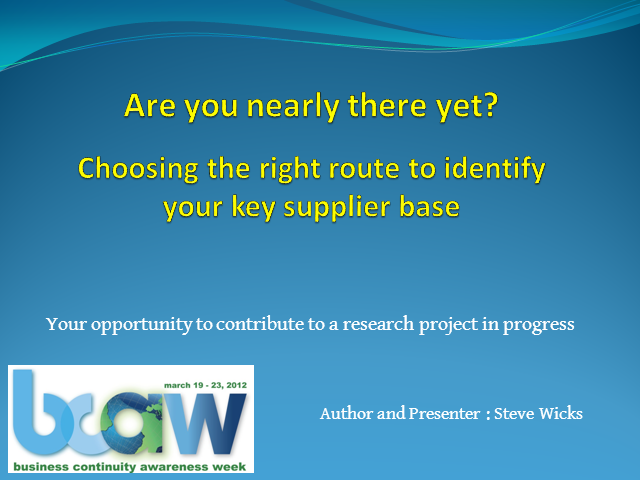 In this webinar, Steve will be focusing on a key aspect of supply chain continuity - identifying your key suppliers – one that is often only defined in terms of “biggest spend”. Steve will show why this is completely inadequate, and share the findings of the study he has been leading, including feedback received from interviews with a number of corporations. A paper on the subject will be published in June.